When you are entering the temple, you ring a bell or bow down on the stairs first. So if you entering God’s own country, I guess it’s necessary to spend some time in its cultural capital. We reached Thrissur at around 9 pm after traveling for more than 12 hours on the highway, so we didn’t search much for the hotel and decided to check in at the lodge near bus stand where I stayed earlier during Onam festival. We kept our luggage in the room and went for dinner. And we had the cheapest dinner of our trip so far. Kerala paratha and egg curry for 2 people cost 40Rs. It was already late and almost everything was closed during that time and we were very tired as well so we went to sleep early that day. We went to the temple in the early morning at around 7 o clock when the priest was doing the morning prayer, so it was worth visiting the temple during that time. We took a round around the temple and spend some time listening to the morning prayers. The temple was really good and peaceful, one can just go inside the temple and take rest in shadows of trees in the garden even if he is not interested in worship. Came out of the temple and we felt like our trip of Thrissur was over as we have visited the main temple and there was nothing much to do in the city. There were some hill station and a waterfall nearby but since we had been to similar places a lot, we decided not to visit them. We came to our room hoping to leave the Thrissur in evening but meanwhile, Bhishma did some research & we decided to check them out. After some rest in afternoon, we started in evening for Guruvayur temple. I was riding the bike while Bhishma was navigating us. Google didn’t suggest the route we took but still, we went on that route. First attempt to go against the google map was failed when we were riding next to the river and suddenly we reached a dead end of the route. 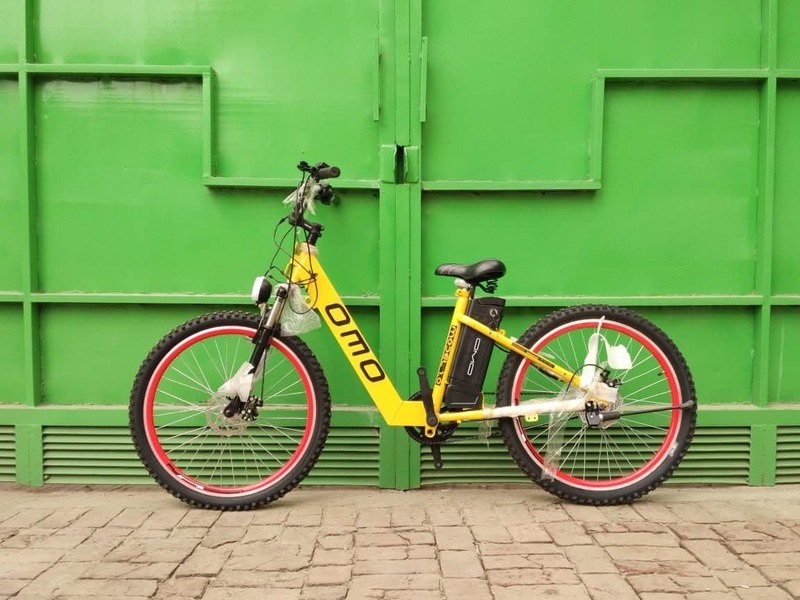 We asked local and they suggested us to take our bike through the stairs which will join the road parallel to the route we took. 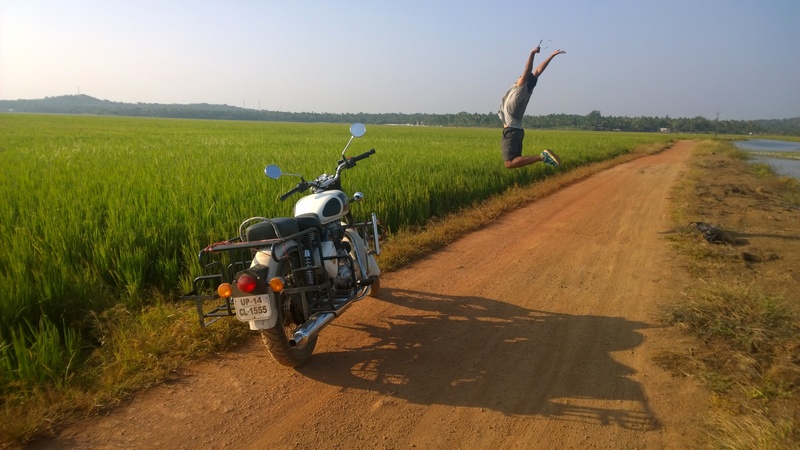 But since we were on the bull (Royal Enfield bullet), we decided to follow Google’s road for few kilometers. Again after few kilometers, we decided to choose our own route and go against google map and this time it worked really well. 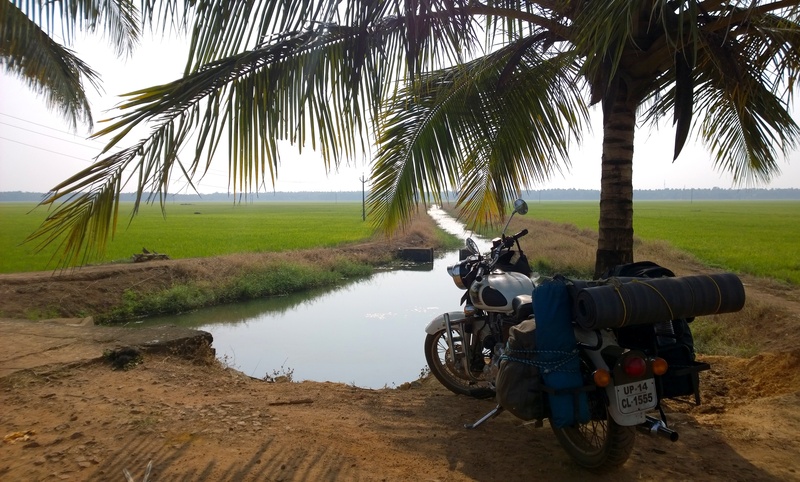 We just kept on driving through the paddy field, small dusty route (no road) passing through paddy field with the river on one side and green paddy field on another side. When you are on such route, it’s impossible to resist yourself from taking photographs. So we took a few breaks for photographs and kept on going without knowing where the route will take us (we just hoped not to find a dead end this time). Luckily this time the route took us in the right direction. We reached Guruvayur temple at around 4 O’clock. The temple structure like most temples of Kerala reminds me of Chinese monasteries architecture. Although of great historical & cultural importance, the architecture of the temple does not leave a lasting impact. We checked out the temple quickly as we had one more temple to visit and it was getting dark now. Since it was already evening and as per Bhishma’s suggestion, we tried another route this time. 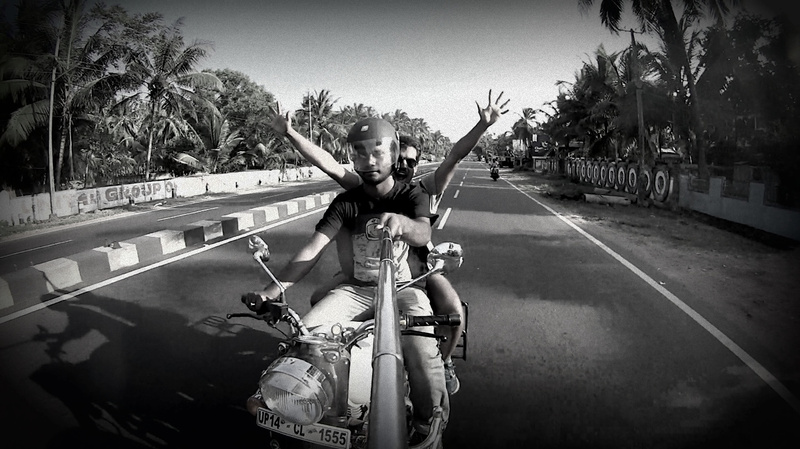 This route was on cost passing through Chavakkad beach. We didn’t realize the beach will be famous but as we were moving towards the beach, we found a lot of local people going towards it (it must be a local hangout place ). As we rode along the beach for few kilometers, we found some festival preparation going on. 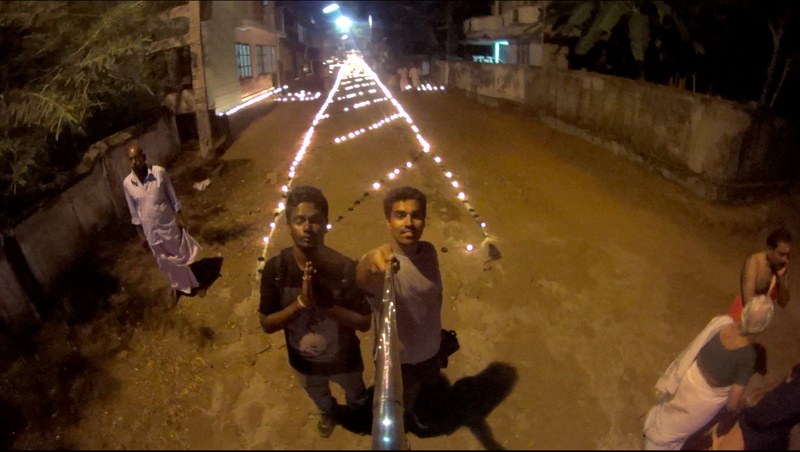 We took a stop and asked the locals and came to know it was preparation for Pooram(The biggest festival of Kerala). Main Pooram festival happens in March-April every year but the nearby villages of Kerala start Pooram a month before it. We collected more details about it and found that next day they will be holding Pooram processions. Our route paid us well. On our way to Thrissur, we saw a small route lighted with thousands of oil lamps (diya). And no one can resist taking a stop after seeing what we saw. We followed the path and entered the temple. This temple was also dedicated to Ram I guess and luckily this time some priest was playing musical instruments (Chenda). We watched them play and as they were increasing the pace of drum beats, the music became more and more hallucinating. The music & the ceremony was enthralling that we could not move ourself and watched them playing those drums for around half an hour. They were playing it continuously and like us, everyone was gathered around them without any movement and just enjoying the music. 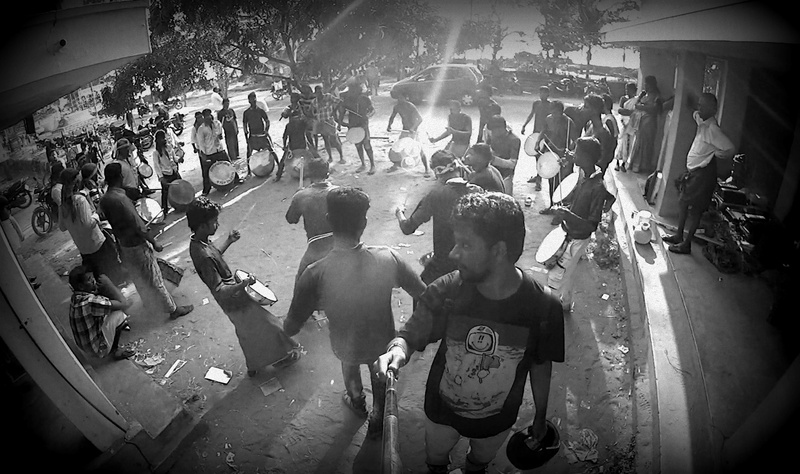 We could have listened to that music for as long as they could have played but we finally to move on, reached our hotel and slept early again hoping to see Pooram next day in Chavakkad village. We reached the Chavakkad again at 4 o’clock. There were 7 elephants (the locals took pride in telling us this. 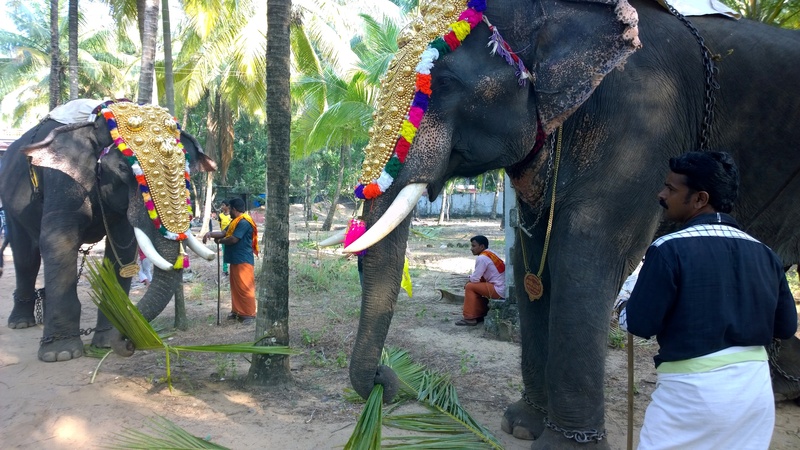 more the number of elephants, the bigger are Pooram celebrations) adorned the traditional way with people playing drums on street (they play drums so madly that you cant passed by them without a stop). We took a stop and tried to figure out what will happen next. Different things were going around and we were actually confused where to go and what to see. We spent some time in confusion and found that the main procession festival will start at 11pm. So we decided to stick to our plan of moving towards Munnar. We had not planned for where to stay, and since we were running late, we just hoped to cover maximum distance and continue next morning for Munnar. By evening at around 8 pm, we reached Aluva which is the last railway station before Munnar. Most people come to Aluva via train and then board a bus for Munnar but we didn’t find much lodging options there. 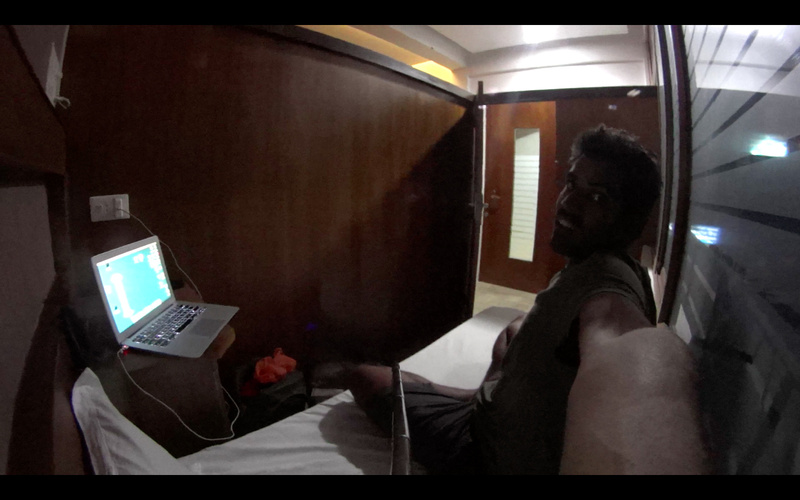 We searched for few places and finally found a dormitory for the night(Rs 200/person). This dormitory was different than what I have seen till now in my travels. Each section of dormitory had space for a single bed with 1-meter distance between wooden separation for next dormitory. It was like the box of wood with a comfortable bed in it and common washroom. Since we were only two people staying there that time, so for us it was not much problem. Next morning we pushed ourself little hard and woke up early morning at 4:30am. We left Aluva at 5 O’Clock for Munnar. Great pics from your journey. The selfie stick is of big help.